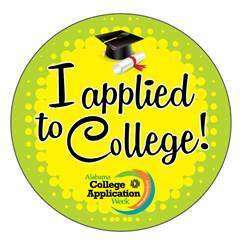 From Monday, October 29, to Friday, November 2, 2018, high school students in Alabama can apply to college for free thanks to College Application Week. College Application Week, a part of Alabama Possible and the Alabama State Department of Education’s Alabama College Campaign, makes it easier for students across Alabama to continue their education after high school. Every Alabama high school senior can apply for free to more than 40 colleges during College Application Week. To apply to participating schools, visit the schools’ website and locate their “Apply” page. Spread the word about College Application Week and tell your story about why applying to college is important using #WhyApply. Learn more about the American College Application Campaign here. For schools outside Alabama that accept fee waivers, click here. Is the free application period for Alabama residents only? Some colleges on the list are requiring payments. What do I do? The best thing to do is call the financial aid office of each school you are interested in applying to and ask them how they’d like to handle. Where’s the complete list of schools? where do you put in the promo code of the university of alabama application? What do you put on the application for the fees on the colleges that don’t have the codes? It will be different for every school. The best way to complete each application without having to pay is to call each school’s office of financial aid and ask them how it works.